After unleashing the massively impressive HTC Legend, its bigger brother, the HTC Desire, is here – faster, bigger and more powerful and still packing the Android punch. It might be the Nexus One rebadged, but this is a behemoth of a phone in its own right; has HTC tried to do too much? We reviewed a Desire from T-Mobile, which is first in line to offer the phone on UK release, but we also checked out our findings from another Desire review unit straight from HTC, to really find out how it compared to the competition. While the Legend was all about style and functionality in one tidy package – the HTC Desire takes a slightly different approach. Instead of the gorgeous aluminium chassis, we’re given a slightly more low-key brown case and a huge 3.7-inch OLED capacitive touchscreen. But while the screen certainly is massive, the phone itself doesn’t seem gargantuan. The screen reaches the edge of the chassis nicely, and the four buttons on the front of the HTC Desire are almost flush and set in attractive aluminium. 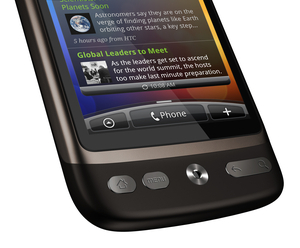 If you’re looking for comparisons between this and the Nexus One, the first is highly obvious: the trackball is gone. HTC has given the phone the Terminator eye once more (head back to the HTC Legend review if you want to know why we’re glad it doesn’t glow red and threaten humanity) which is basically an optical trackpad that registers finger motion over the sensor. The phone is very slim indeed, with dimensions of 119 x 60 x 11.9 mm, and weighs in at just 133g. If you’re counting, that’s 2g heavier than the iPhone 3G and the exact same weight as the iPhone 3GS – and that makes it very pocket friendly indeed. It has a rubberised chassis, which is a little hard to grip at times. We’re not talking so slippy you’ll be dropping it all the time, but it still can be a little difficult to hold in one hand, especially if you have dinky digits. That said it sits very nicely in the hand, with a sumptuous curved chassis feeling very nice and making it easy to press the buttons on the front with the thumb. 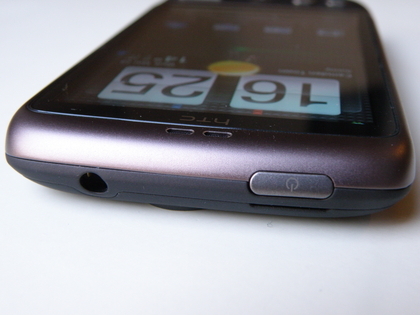 There’s actually very little button-wise on the HTC Desire, with only six in all. 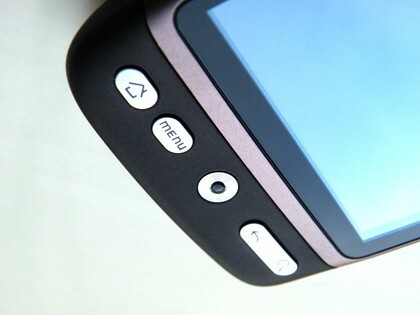 The front four buttons are standard HTC Android fare (Home, Menu, Back and Search) and the Terminator optical trackpad also clicks in as an enter key. 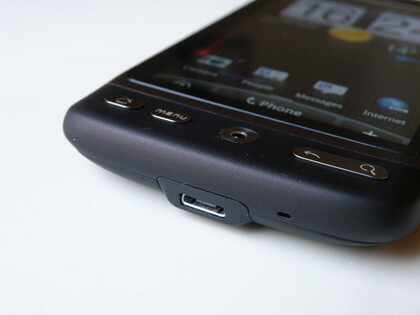 The up/down button on the left-hand side of the phone is flush to the chassis, as is the power button on the top – which sits next to the 3.5mm headphone jack atop the HTC Desire. The power button also functions as the lock key, and is very nicely placed to press whenever necessary (and trust us, we’ve seen some horrors; we’re looking at you, Samsung Galaxy). 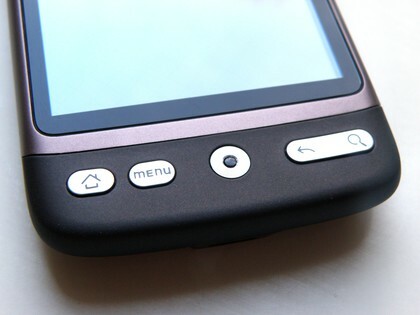 That’s it button-wise, as there’s no camera key (instead the HTC Desire uses the trackpad to take a snap or two) which is a little sad – we still love a dedicated shutter button. The USB slot is hidden at the bottom – no cover to keep the dust out, but on the plus side it’s once again microUSB, banishing the memory of the horrid miniUSB port from HTC designs of old. 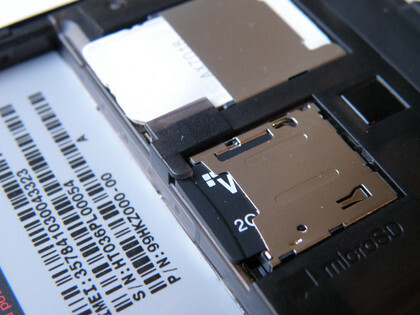 There’s also a microSD card slot for extra memory – but that’s hidden below the battery, and can’t be taken out without turning off the phone. The screen is simply to die for – we mentioned it was an OLED capacitive effort earlier, but that brings such glorious colour reproduction and 3.7-inch is a great size for media and the internet on a phone. It’s a little tacky under the touch – the iPhone for instance feels a little smoother – but we’re being very, very picky with that, as it registers the slightest touch with ease. The design is sleek, and the Desire certainly looks the business – sleek and compact, while still showing off the power of the OLED screen. 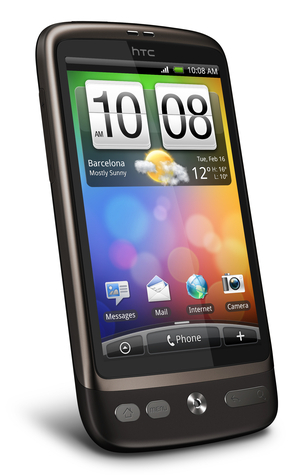 Yes, it lacks the style of the HTC Legend, but we think it more than makes up for that in function. HTC is excellent at keeping packaging minimal, and the Desire once again comes in a coffin-like box with the standard kit inside. This means a microUSB cable, which plugs into an adaptor to make a wall charger, and the standard headphones which double as a hands-free kit. HTC hasn’t seen fit to update these, but they’re functional and work well to use for calls and media, providing you don’t have the same odd-shaped ears as us. There’s not a lot more, but with the minimal space in packaging you can see why HTC has kept the components down. 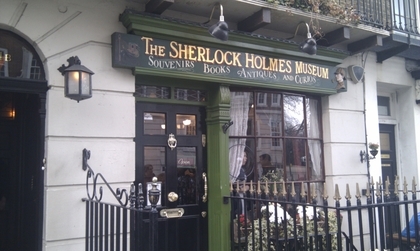 We would like to see some PC software on a CD or memory card, but it can be downloaded from the site with ease. The HTC Desire is rocking the latest Sense UI on top of Android 2.1, and if you’re looking for the best reason why this phone is, in our opinion, far and away better than its Google Nexus One clone, this is it. It simply works, and HTC has cooked in a few extra surprises as well (providing you haven’t played with the HTC Legend as well). 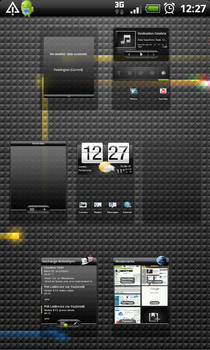 The premise is simple – seven home screens (three each side of the default option) which can be customised with widgets, icons and apps as you see fit, to create a totally unique experience for each user. It’s the same principle Android 2.1 is built on, but HTC has added in a number of its own widgets and options to make things that little bit more special. The large-display clock is included as a default, and below that is the weather in your location (drawn from cellular triangulation data rather than the GPS chip). The weather will also flick across the screen too, which is also cool – if it’s sunny the screen will shine, rainy and a windscreen wiper clears the water drops, foggy and the screen goes cloudy. If you’re showing the phone to someone that’s never really seen a smartphone before, they’ll think they’ve seen a phone from Narnia when you whip this feature out. 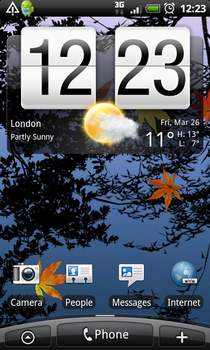 Android is a cool OS, because of the level of customisation on offer. If you want to add a widget, simply long-press the screen and a list of programs, widgets and folders will be presented to you. 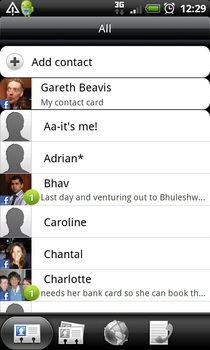 HTC’s widgets include Favourite friends (updated contact profiles from the phonebook and Facebook if enabled) and the Friendstream app, which draws in info from Twitter, Flickr and Facebook. These, like so many others, are offered in small, medium and full screen options, enabling you to keep space on your precious home screen allocation to a minimum. 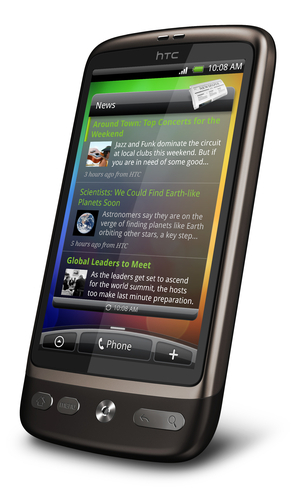 If you want to get rid of anything, then you simply long-press on the icon and the rubbish bin comes up, enabling you to drop it in there and get rid of it – we wish it was this easy on Nokia’s Symbian phones, like the Nokia X6. This method also allows you to re-arrange the icons in the places you want or shift them around too. 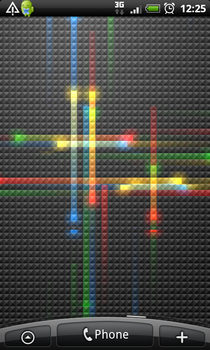 Another desperately cool-but-pointless feature in Android 2.1 is the addition of Live Wallpapers. These are backgrounds to the home screen that react to a number of stimuli – be it your finger, music or simply the time of day. Our favourite is (humorously) called Nexus: basically, it’s a set of coloured lights running across a grid – tap the screen and dozens more explode out under your finger. Utterly, utterly pointless and probably a tiny bit battery-draining… but we still cleared a home screen of widgets just so we could play with it. Search throughout the phone – be it music tracks, text messages from a friend, or any file type – is available simply by hitting the search key twice to call up ‘Quick Search’. It’s very similar to the iPhone’s Spotlight option, but in our opinion it works faster and more comprehensively. And the final cool thing offered by the new Sense UI from HTC on the Desire – Leap View. Basically, pinch the screen in using multi-touch (yep, that’s supported too) and you’ll be able to see all seven screens at once. Very handy if you’re over on the far right screen and you want to check the weather on the far left – pinch and prod and you’re there. 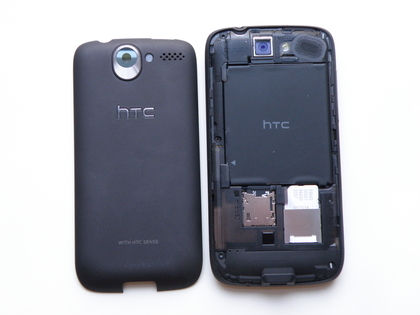 Leap View actually highlights the power of the HTC Desire really well – the processor chugging away under the hood. From the simple swipe to web page panning, the Desire will react to any touch you throw at it no matter how hard you push the OS. Heck, even the weather widget spins through the different cities on offer with speed – we’ve never seen that before from HTC. It’s not that different from other HTC phones, as the Taiwanese company is adept at making its processors work well – but it means there’s never a hint of slowdown. 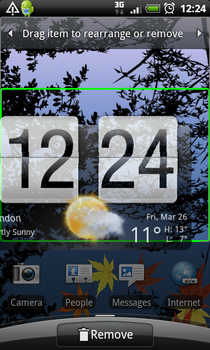 Basically, the interface on the HTC Desire is great because it just does what you want it to do. 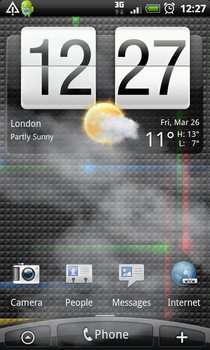 Combining the cool elements of Android (like being able to drag down from the top of the screen to see notifications) with widgets and changeable Scenes (the icons rearrange depending on what time of day or week it is so you can set Work or Home or whichever mode you want) the HTC Desire’s interface is simply tops. Often when we review a phone and we move to the calling section, it’s a very easy task to explain. You press a button, select a name and call. Hang up after, if you want. 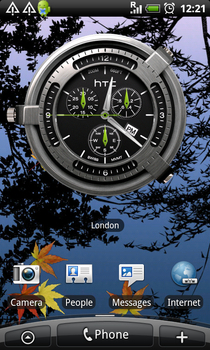 But the HTC Desire just blows that concept out the water. 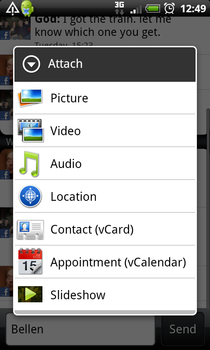 You get such a plethora of options for the contact information, and the call quality and reception is great. 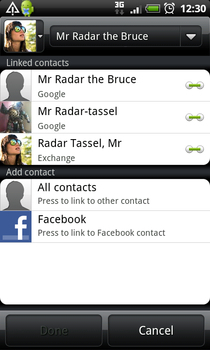 The main thing to know about the phonebook on the HTC Desire is the sheer volume of information you can throw in there. 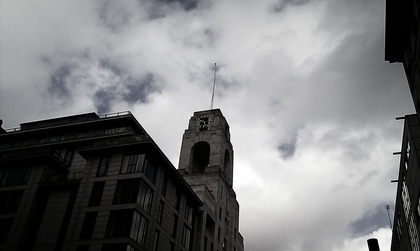 You can link a name with their Google account, Facebook, Flickr, Exchange… oh and the phone number too. Basically, when you turn the Desire on for the first time, you’re asked to log into Google, Twitter, Facebook, Flickr (and T-Mobile’s email service on our test device). Not only does this give you access to your Gmail and populate Peep (the Desire’s inbuilt Twitter application) it adds all the names from Facebook and Google contacts into the address book. Now, here comes the science – you can then link the information all together. The phone will search for common phone numbers and email addresses, and link these profiles automatically – which is cool enough. But then you’re left with around 300 names that should go together, but aren’t – a very time consuming task ahead. Well, HTC has thought of this and while the problem isn’t completely solved, there’s help at hand. Basically, the Desire will search through names and addresses and look for common themes and offer them as suggested links in the top right-hand corner of the screen – making linking a very swift process 99% of the time. Yes, it takes around 30 minutes to set it up when you get the phone, but trust us – it’s worth it. From the linked profile, you get to see call history, Facebook updates, Flickr and Facebook photos, email conversations you’ve shared – simply by sliding your finger across the bottom of the screen along a different selection of icons. Again, we’re talking slick here – the HTC Desire never gives in and won’t judder at all during this process, even when it’s updating and populating. 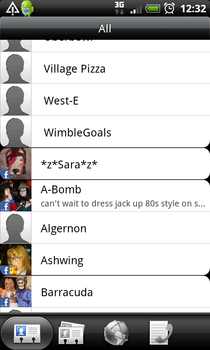 However, there are a couple of issues – when you’ve linked up all your contacts, for some reason they split into two alphabetised groups in the phonebook list – we have no idea why. And we’d like to be able to fire off a Facebook message directly from the profile – we can do it on the Motorola Dext and the INQ Chat 3G, why can’t we do it here? The HTC Desire was a little temperamental the first time we tried calling – it basically just hung there and then disconnected the call, which worried us a little bit. 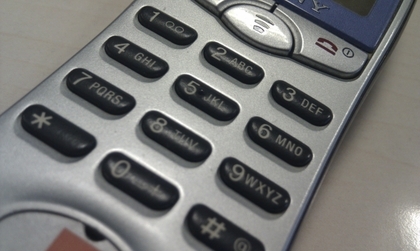 But after that, it was plain sailing – quick connections and easy dialling. 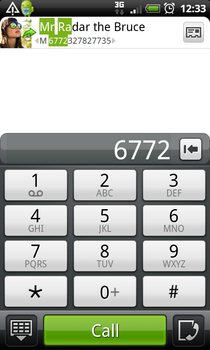 The ‘Phone’ tab is prominent on all the home screens, and pulls up the most recently called contacts as well as the number pad. 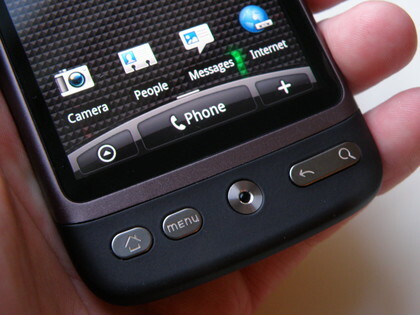 You can also use the dialler as a T9 dictionary to tap in a contact’s name and it will be pushed to the top of the list – a feature nabbed from HTC’s Windows Mobile days. Connection as we said was pretty flawless, although we did have trouble shaking the HTC Desire off roaming networks at times. Basically, it will sniff out an alternative network for data and voice at times – which is great for maintaining signal for calls. But if you want high speed 3G data, that’s not going to happen when roaming; but even when we knew we’d moved into a high 3G signal area, it struggled to jump back. Not a major problem, but slightly irritating nonetheless. The more important flipside of that is the HTC Desire is great when you suddenly pop back into signal – ie when you emerge from a tube. Within seconds you’re up and running again with a good few bars – we know that’s important to a number of users. Like calling, messaging can be a boring experience on some phones. 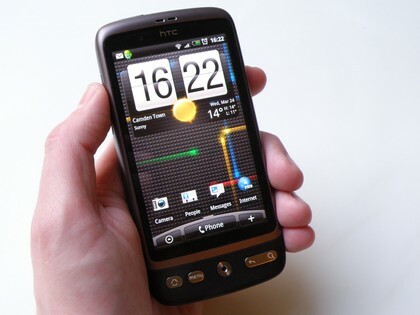 But the HTC Desire offers a number of ways to stay in contact with your buddies, no matter which way you want to chat. First of all, let’s talk keyboards – the HTC touchscreen option is without par in our opinion (the same for the both the Legend and the Desire). It’s frighteningly intuitive, and it learns as it goes along – if you use a word often it will remember it and default to it when the relevant keystrokes come along. And if you’re taking your first worrying steps into button-less keyboards, we couldn’t recommend this option more highly. You can deviate miles from the intended buttons, and nine times out of 10 the Desire will work out the word you wanted by default. And thanks to a large and expansive screen, the Desire is even easier to type on than the Legend. Messaging is handled in a number of intuitive ways – from threaded conversations for SMS text messages to high end Exchange support. 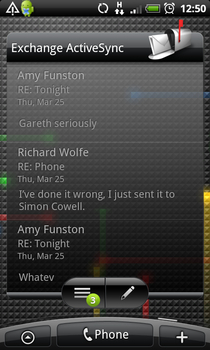 Your inbox is divided into conversations with contacts, and you can simply tap in to see what’s been said. If you want to convert a text into an MMS, you simply add in elements like pictures, sound or a contact card – light years ahead of having to remember a number and tap it into a text. 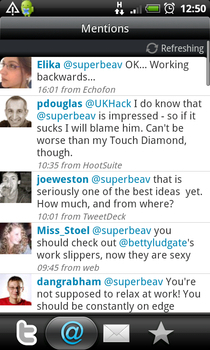 Twitter is also well-used through the Peep application – one of the issues with the HTC Legend was the @replies took a long time to update and wouldn’t appear, even if you’re notified there is one. Thankfully the latter has been fixed with the HTC Desire, although it can take a while to find out someone has tried to Tweet at you. 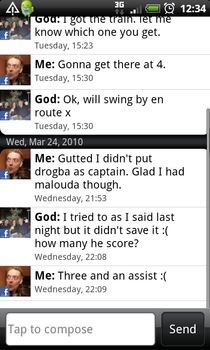 Google Talk is also included as standard, allowing you to chat to your buddies online. Sadly there’s no integration for Windows Messenger or similar out the box, and we’re sure we’re not alone in never having many of our friends on Google Talk at any one time. As we mentioned email is a big part of this phone too – be it Gmail, POP3/IMAP webmail accounts or Exchange. All three are easy to set up, with a few details all that’s necessary for the HTC Desire to sniff out the relevant settings. Exchange email is set up in the traditional inbox format, but sliding the finger along the icons at the bottom takes you to files with attachment and conversations, making it easy again to see what’s been said in the chat so far. Email addresses are highlighted within the mail itself so you can tap and use them – you can do the same with phone numbers, but these aren’t highlighted. Well, we say you can do the same, as it works for strings of numbers, but if there are spaces present the HTC Desire can’t work out the full number to use. You can choose the speed at which mail is pushed to the device from all these accounts, from Push email to timed downloading to only updating when manually forced to do so. There’s no lag at all with push email – and it just works well. 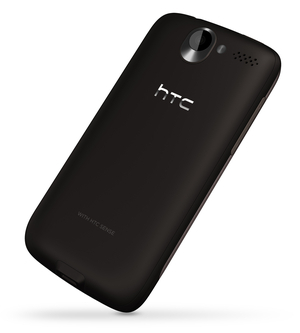 We know we keep saying that, but it’s a constant theme with the HTC Desire. A couple of very minor issues with the Desire’s messaging system – you can’t save SMS messages to the microSD card (though you can to the SIM card) and you have to delete POP3 messages separately; you can’t do it all at once to clear an inbox. HTC has been working long and hard on its Android internet browser, and has continued to update it to keep it in line with the top level on offer with today’s smartphones. The LG Arena managed to have a full HTML browser with pinch and zoom navigation, but it was slow and clunky, so it’s not a given that chucking in multi-touch will sort everything out. 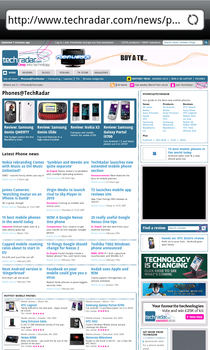 But the HTC Desire’s browser is tip top – pinching and zooming takes you in and out at superb speeds, and the text reflow software on the Desire is brilliant, like its HTC brothers. 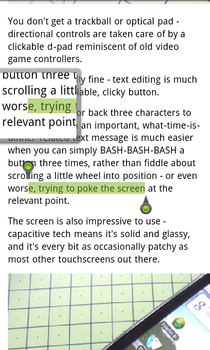 Basically you can keep moving in further and further on the words, and the phone will keep reformatting the columns to fit the screen – it makes reading the longer articles very easy indeed. The WVGA, 3.7-inch screen also look immense – zoomed out, you can see a huge amount of the web page, and in high detail as well. The web browser also has copy and paste as standard too – simply long press on any bit of text and two little draggable pins will appear to select the text you want (with a little magnifying pane to help things out). Like we’ve said before – this is a little bit iPhone-like, and we wouldn’t be surprised if Apple included it in its current lawsuit against the Taiwanese firm. Flash video is also present and very much correct on the HTC Desire. We navigated to a number of different websites with embedded video, and the HTC Desire showed the content within the browser or via a dedicated Flash browser. 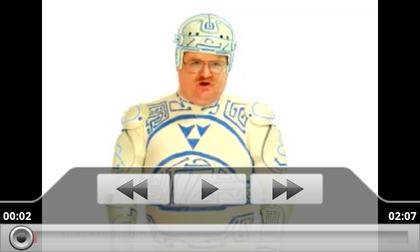 We did encounter a slight issue – Flash video didn’t want to work properly on the higher end sites and content. It wouldn’t support iPlayer for example, and video on the BBC website was juddery. 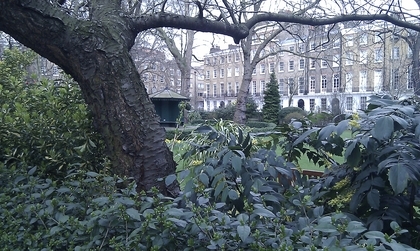 Channel 4 On Demand on YouTube wouldn’t work either – but other videos on the Google-owned video site functioned fine. Either way this will likely be fixed in the next couple of months – Flash 10.1 is on its way for Android and should make all Flash video fine to use. Bookmarking on the HTC Desire is also pretty darn cool – the visual thumbnails, based on the latest website content from your last visit, are a nice way of navigating through your favourites. And if you forget to tag a favourite site, slide your finger along the bottom to find your most visited sites and history – making it easy to find oft-visited sites. 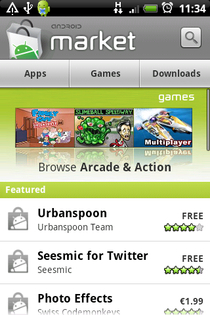 Other little titbits from the HTC Desire browser include easy downloading of images by simply long-pressing the image and selecting save. You can also share text you’ve copy and pasted to the likes of SMS and Facebook – or the whole web address of the page you’re looking at instead. This is also really helpful for the integrated Peep Twitter app – if you see something you want to tell your buddies about and you’re only three taps away from doing so. 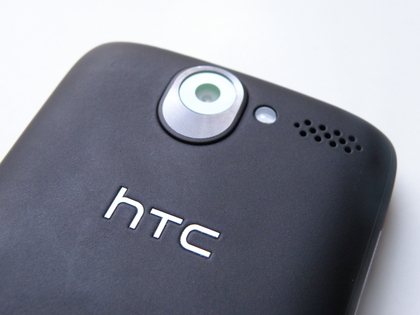 The HTC Desire shows another progression for Taiwanese company – the camera is now streets ahead of previous models. Be it the poor efforts of the HTC Magic and G1, or the odd halo effect on the Hero, HTC has never been one for camera power. 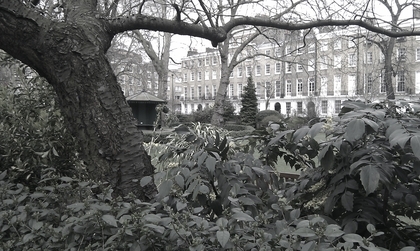 But the 5MP snapper on the HTC Desire will turn even the most mundane mo-pho (mobile photographer, of course) into a click-happy junkie. 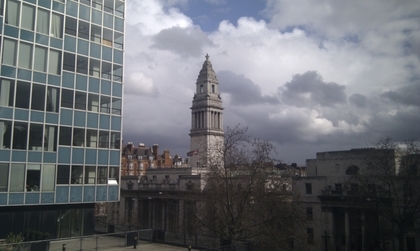 We’re not saying that the HTC Desire is the equal of anything like the Sony Ericsson Satio or the LG Viewty Smart, but the 5MP effort is easily as good as you’ll need on a mobile camera. The camera interface has been overhauled for the new version of Sense as well, with a number of options to tweak to improve your photos. Options for brightness, contrast, saturation and sharpness are all altered by spinning dials on the screen (brought out by a simple touch on the menu tab). 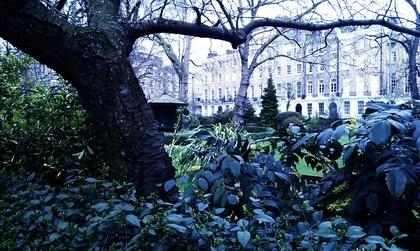 You can also mess about with the ISO settings, geo-tagging, face detection and more – as well as sepia, negative and posterise effects among others. 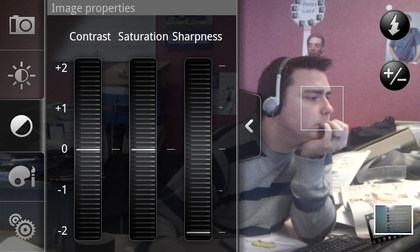 And the thing is all these elements make a difference – photos can genuinely be enhanced by playing with these settings. While we’re still lamenting the loss of the dedicated shutter button, the optical trackball is a good secondary option for taking snaps. 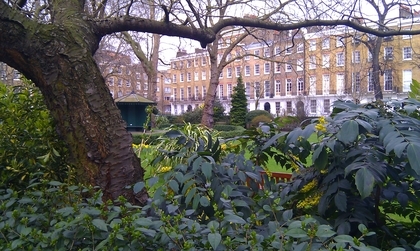 The camera automatically keeps refocusing on the scene in front of it, which negates the need for a half-press on the shutter key to bring the picture into sharpness. You can either take a snap by pressing the optical trackpad, or long pressing on the screen – focusing and adjusting the white balance depending on your chosen area. The latter option has been tweaked somewhat over recent versions, and a longer press is better as it means you don’t accidentally set the camera off when trying to point to a section for the camera to focus on. The video recorder comes in a variety of formats – both resolution and recording codec. You can take video in QVGA (320 x 240), CIF (352 x 288), VGA (DVD quality, 640 x 480) or WVGA (800 x 480), and all four can be recorded to MP4 or H.263 formats, with the resulting file appearing as 3GP. 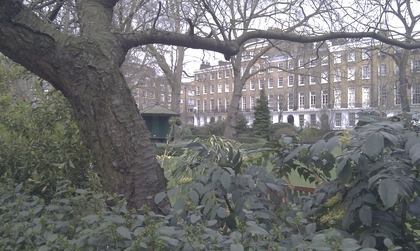 We’re told that the HTC Desire records at 30fps, but as you’ll see from the test video that seems a little far reaching. It’s actually clocked at 15fps, but that’s dynamic – the phone will increase the rate to over 20fps in other lighting conditions. HTC is also only allowing audio recording to AMR, rather than the superior-quality AAC (which is supported by the Snapdragon processor). We’re thinking this is something that may be tweaked in future updates, but isn’t going to matter to most users in day to day action. Some people we’ve spoken to have lamented the fact the HTC Desire doesn’t have HD video recording as on the Sony Ericsson Vivaz – we don’t think it’s necessary on a mobile phone, especially when you have to wedge it into a chassis the width of a pencil. 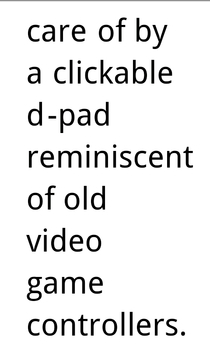 It might improve resolution somewhat, but it’s not that noticeable on the phone screen or when ported out to a larger display, so we don’t think the Desire should be marked down for leaving it out. 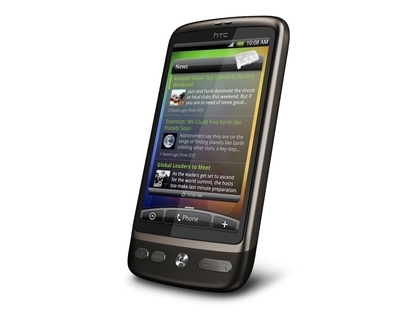 The HTC Desire is an upgrade in the media department over the HTC Legend for a number of reasons – the first being the fact it has an upgraded audio performance in the shape of Dolby Mobile enhancement. This isn’t mentioned in the settings or anything, which makes us wonder if it’s a big part of the audio experience – but in comparative tests, it seems to offer a richer bass sound and a nice mid range too. 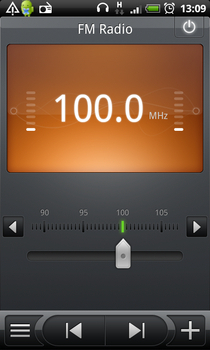 The music player is the same decent effort as seen on other HTC phones – it features large, easy-to-hit buttons on the main player and cover art that you can swipe through in both portrait and landscape modes. 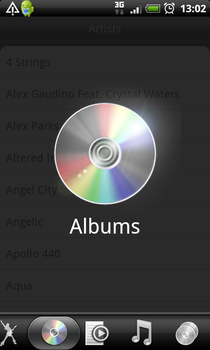 Navigating through tracks is segmented into Artists, Albums, Tracks, Genres and more, with the option to look at your purchased tracks as well – although we’re yet to find out which store you’re meant to purchase them from. You can select the different methods of track navigation by simply sliding your finger along the bottom of the screen, as is common throughout the Sense UI. 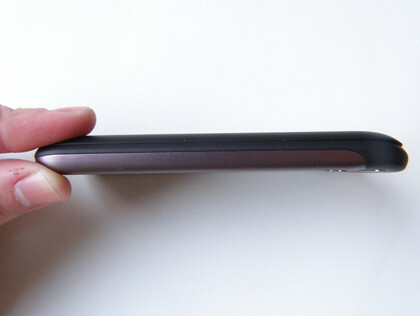 The HTC Desire packs a 3.5mm headphone port as you might expect, but this is curved and not flush to the chassis – which leaves a section of the headphone jack uncovered. It doesn’t affect the performance of the phone, but it does leave your headphones exposed to possible damage. The main music player is easy to use and works quickly on the HTC Desire – the 1GHz processor powering things along nicely under the hood meant there was very little track stutter or skipping when trying to browse through the phone’s library. 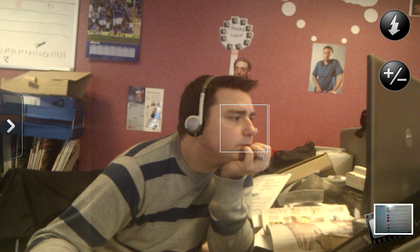 The video player is, once again, hidden in the photos section. We don’t know why, and HTC haven’t been able to furnish us with a decent reason either – but at least the icon hints at it with a little video picture. The photo and video gallery is easy enough to navigate too – you can see your files as images, camera shots and downloaded pictures, and the video is divided up into recorded movies and those you’ve slung onto the memory card. Swishing through your photos is a really pleasant experience too thanks to the processor – it renders the images snappily and without a hint of slowdown, so you’re not looking at a pixellated version of your mug for too long. The video is predictably sublime on the HTC Desire – you can imagine if you add widescreen VGA resolution to a 3.7-inch OLED display with a 1GHz processor the movies will look sumptuous. There’s sadly no dedicated GPU on board as far as we can tell, but that doesn’t seem to matter too much when it comes to watching videos. UPDATE: Apparently the HTC Desire does have a GPU, although we’re still trying to pin down which is is as HTC hasn’t released the full specs. But it does explain the great video and Google Earth performance (which we urge you to download). The screen is a perfect size for watching video, and if you add in a Bluetooth headset, it’s a great experience to wirelessly skim through some videos. Talking of which, you can slide your finger through the movie by simply dragging it along the bottom bar and it will jump instantly to the right point in the movie – just as you’d expect. However, there is a problem with the Bluetooth side of things, which worries us slightly. 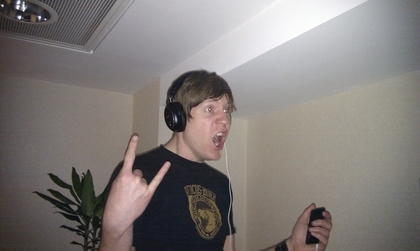 When using the new Jabra Clipper Bluetooth device (which allows you to use your own headphones wirelessly) the sound stuttered when using the music application. It wasn’t apparent when watching video, and it was a lot better than on the Legend, but it still niggled somewhat that we couldn’t have flawless Bluetooth performance. YouTube is also included in the Google stable of applications with the HTC Desire, and it works just fine, especially over Wi-Fi. Using this connection it automatically seeks out the highest quality video, and that looked great on the WVGA screen. 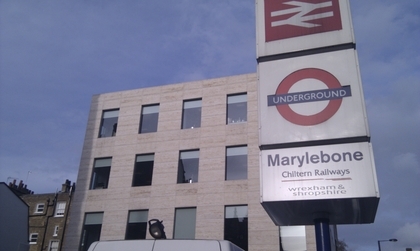 It didn’t like connecting as well over 3G at times, despite having a couple of bars of signal – although this was a rare occurrence. The FM radio included was of average quality – it scanned and found all the major radio stations when first turned on, but sometimes struggled for clear signal. It also took an age to turn on, and there’s no RDS, meaning you have to name all the stations yourself, which is slightly irritating. We’d have also liked to see the option to record radio as well, as is present on the Samsung range (such as seen on the Samsung Jet). Overall though this is a powerful media device, and with an 8GB memory card in the box (expandable up to 32GB) it’s a phone that has a load of media potential. 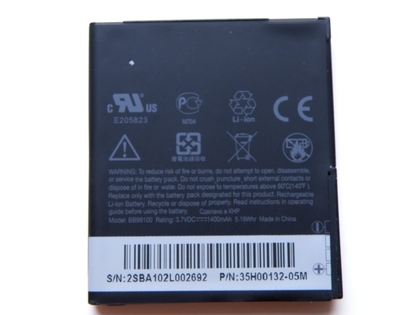 The battery in the HTC Desire was ‘only’ a 1400mAh effort – we’d have like to see a 1500mAh option there, as is the case with so many other smartphones at the moment. We’re also a little concerned about the battery life – it dropped rather quickly, and although you’ll get a day’s worth of use out of it under normal use (ie web browsing, calling etc) it can drop a little alarmingly fast at times. We had a little look at what was munching on the power so much (thanks to the Android battery meter) and it seems to be the widgets (in particular FriendStream) and synchronising that’s taking a lot of the power, along with the constant flicking to roaming networks and back to 3G. We found a big increase in battery life if we stopped updating Peep, Friendstream and emails all day long, and when set to ‘2G networks only’ the battery life also improved to three days’ use without problem. We’d also advise you download Advanced Task Killer from the App Market – it’s a great way of shutting down running programs and thus saving you a lot of battery life. We’re used to having to charge a smartphone every day, so we don’t see this as much of a problem, and it’s good there are options to extend the battery life if you want it to last longer. 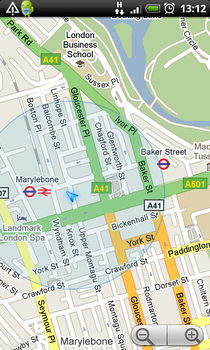 Google Maps, as you can imagine, is included as standard – we urge you to upgrade to GMaps 4.1 as soon as possible. Basically, this has overhauled the UI so you can swipe through categories when clicking on an address – you can see information and reviews much more easily than before. 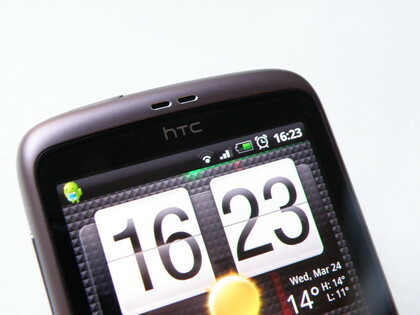 The GPS signal also locked on very fast with the HTC Desire, making finding yourself on a map very easy. 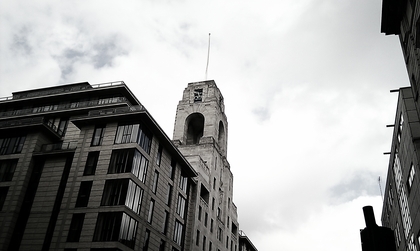 The UK still isn’t deemed worthy enough to have the Google Navigation feature as yet, and we’re starting to doubt if we’ll ever have it, especially if it’s a legal issue for Google. 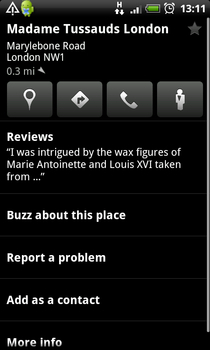 It’s a shame, as this could be a great Sat Nav with the bright and clear screen to play with – and the Nexus One is clearly set up to be just that in the US. There’s one last cool surprise with Google Maps 4.1: a new live wallpaper. You set it up, and suddenly the background shifts to where you are, highlighted by a little dot. And if you’re friends are nearby and logged into Latitude, you can see that as well – creepy but handy if you don’t want to have keep logging into maps to see what’s going on in your area. 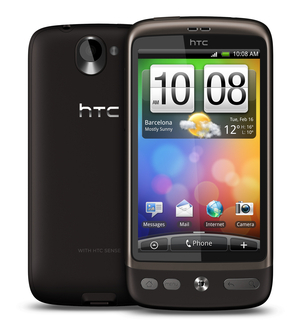 The HTC Desire packs the usual range of Android connectivity – Wi-Fi b/g, Bluetooth 2.1 with A2DP, aGPS, 7.2Mbps HSDPA – the works. The Wi-Fi is as good to set up as ever, and whenever you walk into range of a remembered network the HTC Desire will automatically connect. It’s better at maintaining signal than the HTC Legend, which as we mentioned before had a few issues connecting to Wi-Fi on the odd occasion. 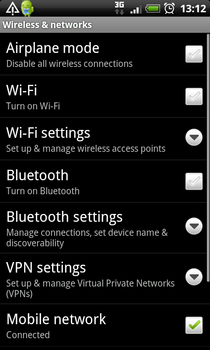 Bluetooth is similarly good, with both methods of connection offering the same easy to use UI – basically turn it on and a list of connections pops up. Simply tapping on these will link you in – no faffing about with separate screens for passwords or codes, it’s all done on the same screen and once connected, Bluetooth will also auto-connect with devices in range. GPS as we mentioned before is solid, allowing you to not only flick around Google Maps with ease but also geo-tag your photos in you’re into that kind of thing. 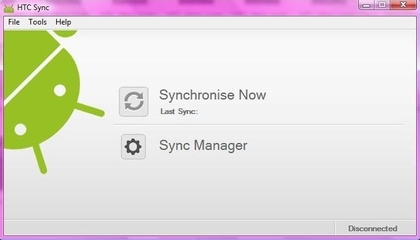 The PC software was once again not present – downloading HTC Sync found the phone and registered it under the Desire name, but failed to synchronise or connect to actually back up the data. At least you can perform this function on the phone by backing up data to the memory card – that way if the phone crashes and loses all its data (or you delete something important in a drunken fug) you can back it up. There are a variety of applications offered on the phone from the start, such as Facebook, a desk clock, PDF and QuickOffice as well as a motion-sensitive game in Teeter (which is a lot like labyrinth). But the Application Store is becoming a real force in the mobile applications space – it may only have 25% of the applications that are present on the Apple App Store at the moment, but Google has promised that it will have 130,000 apps on its books by the end of 2010. This means it will have more than enough apps to keep you occupied – and means that most of the big brands will probably have brought an application to the Android as well. Considering that most will have this phone for two years, the fact the application Market might not be as well populated as the App Store isn’t as big a deal – there are a lot of applications missing at the moment, but that will likely change in the next few months. One of the problems is still not being able save applications to memory card – this means developers have to make games small, and therefore low function. This should change in a near-future update to Android, thus opening up the application Market to a wider range of developers, and making applications a lot more interesting. 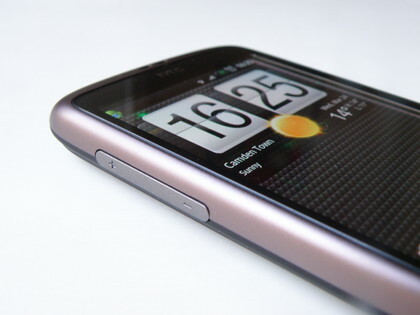 The HTC Desire is a feature-rammed phone with the hardware to support it. It’s got a huge screen with the 1GHz processor underneath, and the Sense UI is a system that keeps getting better with every iteration. Coming just after the HTC Legend, it improves on all the issues we saw with that (battery life, Peep and Friendstream slow to update etc) and adds in some decent extra hardware as well. We liked nearly every single thing on the HTC Desire – it just works as you want it to as a phone and an internet tablet at the same time. The Sense UI, Leap View and social network integration is all seamless and useful, the Live Wallpapers are super cool and the internet browser with pinch to zoom is fantastic. Music and video playback was rich and simple, the camera is probably the best we’ve seen from HTC, the overall experience was fast and intuitive – in short it’s easier to find things we didn’t like. We’ll level with you – there’s not a lot wrong with this phone. The Bluetooth music playback is a little patchy and the battery will drop a little easily if you leave everything updating in the background. 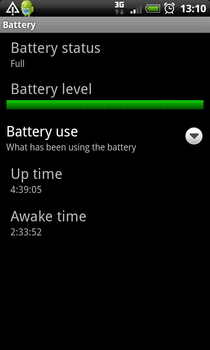 Although the latter is a little annoying out the box (HTC wants you to use lots of updating widgets from the start) once you take some things down (or set them to manually update) the battery use is a lot better. In short, this is a phenomenal phone – one of the best we’ve ever had on TechRadar. Usually when we like a phone on the first use, we end up horribly disappointed after a little time with it, but the HTC Desire kept on performing and achieving when we thought it wouldn’t. The screen is lovely, the design is slick and processor makes everything happen in a flash – all you’d want from a smartphone. Sure, some people will want slightly nicer design (we’d advise you check out the Legend) or a simpler home screen and richer app store at the moment (look at the iPhone 3GS) but as a piece of hardware it’s without par in the mobile world. A stunning phone, and one that will show the world that Android isn’t just for the hackers and phone geeks any more.